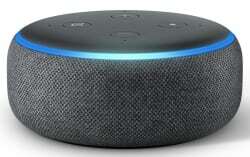 Belk offers the 3rd-generation Amazon Echo Dot in Charcoal for $20.99. Pad your order with a beauty item (eligible items start at $3) to bag free shipping; otherwise, shipping adds $8.95. That's within a buck of the best price we've seen and a low now by $9. (We saw it for $20 in-store at Target on Cyber Monday.) This current-generation Echo Dot features a new speaker design, making it 70% louder than the previous model with better sound quality.